Mid-Life Cruising!!! 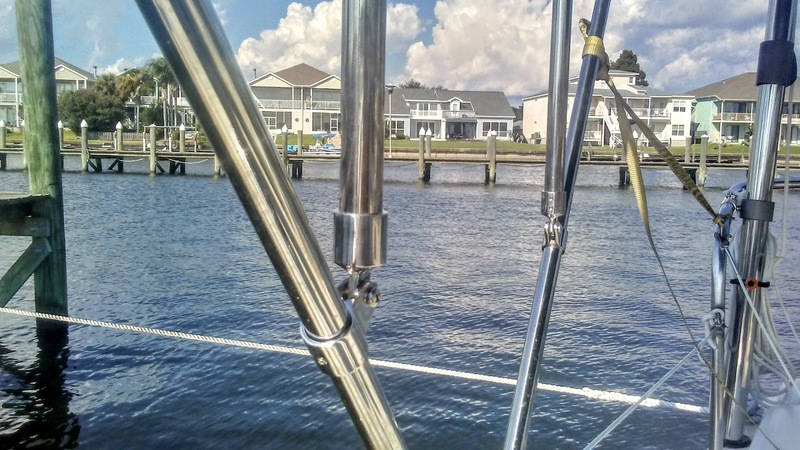 : New Stainless Bimini Frame! Several years ago we had a new bimini sewn for our bimini frame. As with our Tohatsu and dinghy, our new Sunbrella bimini went into storage. 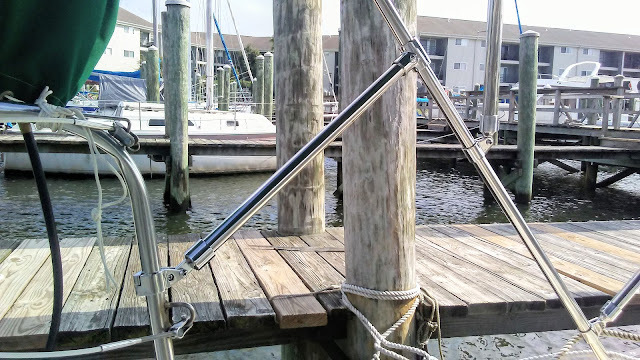 Now that we were ready to remove our tarp and bring out our ole "new" bimini, we wanted to replace our flimsy aluminum bimini frame with stainless steel tubing. We thought this would be pretty easy, but finding someone to bend stainless steel tubing to duplicate our aluminum bimini frame was no easy task! 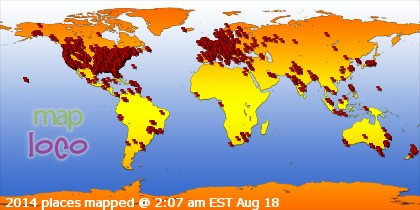 We called every place we could find from New Orleans, LA to Biloxi, MS. They all told us that they'd sell us a new frame AND bimini, but they wouldn't bend stainless to duplicate our aluminum frame. We couldn't bring ourselves to purchase another bimini when we had a brand new one in storage! Who knew this would be so difficult?! Finally, we found "The Canvas Man" in nearby Mandeville, LA. After our experience with calling other places, we thought we may have better luck if we talked to the owner in person .. and with our frame. So, we loaded our aluminum frame into our truck and brought it to the owner, Jeff. 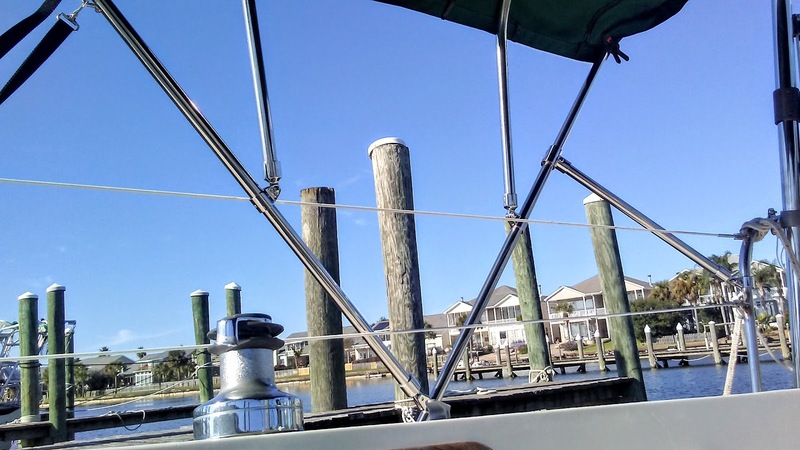 He was willing to duplicate our aluminum frame with stainless steel tubing .. without a new bimini top! A couple of weeks later, we picked up our new stainless steel bimini frame. It's nice to have a frame that's not only much more stable, but shiny too! (The photo below didn't have the stainless steel tube installed at the rear yet .. thus the yellow strap). While our bimini doesn't fit quite as tight as it did on our old aluminium frame, we're happy with the results. 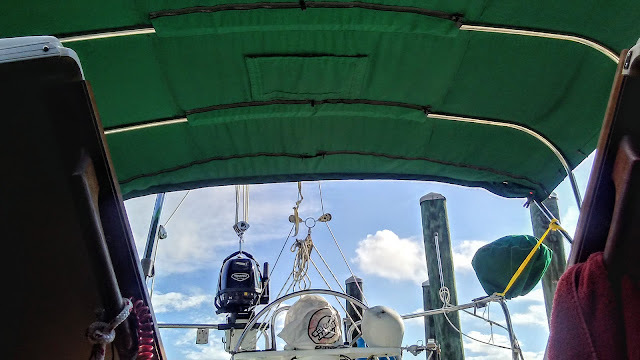 If you look closely in the first photo, you'll see a black clip tightening the loose back corner of the bimini. We have a clip in all four corners, and we'll get the corners sewn tighter in the future. 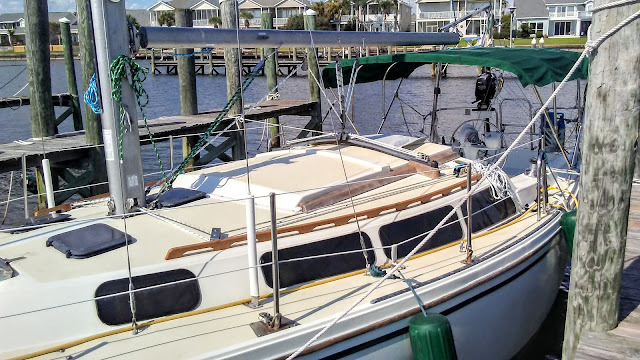 It's no big deal considering the money we saved by not starting completely over with a new bimini top! 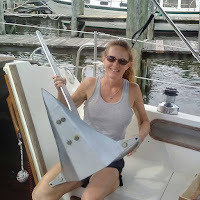 Since this photo was taken, we've added black straps to the front corners of the bimini, and stainless tubing at the rear corners. and here's a view of the stainless frame. It's great to have shade again, and when we're spending all of our days living at anchor we're gonna be glad we have it!